Reasons for attending and participating in congresses vary. There are those who like to travel and meet neurologists from other parts of the world, which they will never do even if they visited their countries. There are others who are attracted by the lure of the big names of speakers, the organizing associations, and the attractiveness of the cities. For world congresses, the attendees come in the thousands because the meetings transcend national, regional, or specialty categories. This means that there is something for everyone. If you look at national neurological society meetings, they tend to have few outside speakers, but the attendees are colleagues, perhaps in the same institution or the one next door. You tend to know most attendees, and it serves not only to listen to what others are doing in their research or how they practice, but to hear about gossip and job opportunities and to obtain postgraduate certification. Perhaps another advantage/disadvantage is that of language. Many national meetings are in the local language, which is well and good. The advantage is that neurologists will have a better understanding of what is being said and will be clearly advised on practice parameters and guidelines. On the other hand, the language of medicine and science is English and many national associations’ congresses will either have sessions in English or have completely changed their language to English. The reasoning is clear. If a neurologist or a neuroscientist would like to publish internationally, then the only way to get a recognized indexed paper is to use the English language. In essence national congresses are all well and good, but they lack an international outlook and global interaction. The second level is that of major regional international associations’ congresses, which are geographically distributed. There are six such congresses; two are annual and four are biennial. Some of these are well attended and professionally organized. However, in some regions with nascent associations, the concepts are still developing. The big regional organizations’ congresses are attended from outside their regions, and this is important for interaction. Such organizations certainly encourage work to be presented as well as out-of-region attendance to boost their figures and standing. Looking at the plethora of specialty meetings and congresses, they obviously concentrate on specific topics. The degree of interest varies enormously. The speakers are obviously well known in their fields, but perhaps at times tend to concentrate on fine detail, which may not be of major interest to the audience. The attendance by and large relies on support from various sources to register and travel. The major advances in the specific field tend to be presented. Even if the neurologist is interested in the field in question, after a day or so the topics become a bit repetitious and some, if not the majority, will lose interest. Specialty congresses, however, have a pivotal role to play in educating not only neurologists, but to propagate neuroscience in specific fields. Scientists may not have the funds to attend big international jamborees as their travel funds come from grants that rightly limit their ability to travel. Over the last decade or two, there has been an explosion in attendance of other health care professionals who find attending specialty meetings vital. Nurses, therapists, pharmacists, and psychologists, to name a few, all need to listen to advances in their chosen field of specialty. These fields tend to be by and large covered in specialist congresses. The majority of such practitioners will shy away from large general international congresses. Drug industry-sponsored congresses and meetings tend either to be directed at a local group of medical practitioners or a targeted audience chosen by the sponsors. Governmental rules are rightly restricting sponsorship because public opinion is clearly against such practices. There is certainly a place for informing neurologists on the availability of certain drugs in their locality, and there is definitely a role to be played by the pharmaceutical industry. However, this has to be limited and controlled, rather than left to a self-governing code of practice. In many parts of the world, governments will forbid pharmaceutical company sponsorships within the same country. As an example, if a meeting on a specific topic is being organized in a certain city, only neurologists from that city and not from other parts of the country, let alone internationally, can be sponsored to attend. Presentations in pharmaceutical industry-sponsored meetings and symposia are primarily viewed as being at least partially one-sided. The majority of speakers declare their financial interests and do their best to provide non-biased views in their presentations. However, we cannot escape the fact that neurological public opinion tends to take the presentations with a pinch of salt. Even at major international congresses, sponsored symposia are separated from the main themes of the congress and portray a different point of view. We have to remember another issue of funding congress attendance. In many parts of the world, the neurologist, as well as any other medical practitioner, can claim tax relief on congress attendance as part of the annual continuing medical education (CME) requirement. This practice in some localities is limited by governments to national meetings, and in some instances to international congresses, which carry certificates of approval from major international medical institutions. This practice has to be strict, as it deprives governments from taxation. As you are all probably aware, the upcoming 23rd World Congress of Neurology (WCN) is being held Sept. 16-21, 2017, in Kyoto, Japan. We are all grateful for the Japanese Society of Neurology for hosting us. 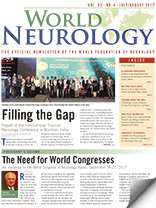 This is the showcase of global neurology. The biennial nature of the congresses makes them that bit different, and the general nature of the program is an attraction to many. The basic principle is to involve all six regional organizations and all of the specialties in neurology. Each one is asked to provide a program with conveners and speakers so that the essence of the specific field is distilled into one congress. Moreover, each congress is hosted by a national neurological society, and the competition is quite fierce. Holding the WCN is a privilege to the national society and its region. Congresses bring benefit to the society and the region. This has been seen time and again. The WFN makes sure that our congresses are not, in the old sense, carbon copies, but have a basic structure and a distinct local flavor. Kyoto is no different. The Asian region’s competition was fierce, but the WFN council of delegates voted to award the congress to Kyoto. The WFN system of egalitarian democracy is unique in that the WFN leadership can only watch the delegates vote and decide. The choice and the decision is theirs. Once the decision is made, the WFN works closely with the host society to produce the scientific program, teaching courses, and social programs. The role of the WFN and its congress organizer is to closely advise the host society on how the whole congress is constructed using previous experience, but adding a local touch. The WCN is therefore a balanced and an appetizing mixture of all types of congresses — national, regional, specialty, and industry-sponsored meetings. The attendee is presented with the best of several worlds in a concise and a most perfectly packaged setting. There is no doubt that it is a unique opportunity. I urge all of you to attend.